Sometimes getting team dynamics is not about having a team building guru come in but about remembering the joy of team work. It is easy in the hurley burley of day-to-day tasks, deadlines and pressures to forget we are working with other human beings. The pressure to get a job done can sometimes over shadow the team connection. We forget to rely on each other. Instead seeing any interruptions or distraction as an intrusion into our space. Of course, there are some things we need to do as individuals but the ultimate success of any project or organisation comes down the sum of its parts – the team. Next time you are cursing being part of a team and the boss is suggesting a team building exercise, remember these six points of the benefits of being in high functioning and happy team. There is something exciting about putting heads together to come up with creative solutions, brainstorming new ways to look at an old problem. When teams get creative together, there is infusion of motivation and freshness that comes from combining unique perspectives. Being creative on your own also means there is no one there to celebrate the triumph of coming up with something new. When you bake a cake, you have to have all the right ingredients to get it right, so it rises. Same with a team – none of us have all the skills and characteristics necessary to be good at everything. Each of us has our set of abilities that when combined with a team can add value to the overall project. When we rely on others to get a job done, it builds trust. WE know that person has got our back, we are not on our own. Of course, we are not always going to agree with each other -we are human after all but an effective team working together can create a strong bond. When you trust your team, it gives space for creativity to flourish and is a safe place to come up with new ideas. Without trust, nothing works, and this is where things fall apart. That’s where a good team building session with African Beat comes into play. 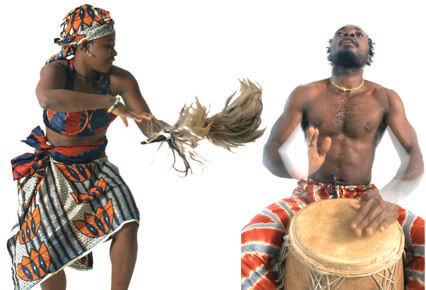 The power of drumming, being in harmony together brings people closer and cements a trusting environment. You cannot have a bunch of people working together and everyone gets along all the time. People come from different backgrounds, different ideas and different habits- some of those can be irksome. But working as a team can teach us how to work through those differences, be more accepting and how to avoid minor differences become major conflicts. When teams trust each other and embraces each other’s strengths and differences, it creates a great place to take ownership of wins (and even losses). Not the bungee jump type but the strength in unity type. There is reason for the saying safety in numbers. When working something together, it feels safer to stick your neck out as a team rather than just you. Working as a team means you can take more risks because the team has got each other’s backs. African Beat has impressed groups from 10 to over 1000 participants. We have the experience under our belts to deliver a successful drum team building event for groups of all shapes and sizes. So, if you want to try something a little different but something that is jam packed with fun and laughter, contact us today.